The original title for this post was going to be "where are all the birds?" as it was an unusually quiet day at the park for wildlife. Though there wasn't a cloud in the sky and the sun is at a much higher angle now, you wouldn't know by the temperatures that March starts tomorrow! Our high for today was around 18 or 19º and it's still windy enough to feel much lower. I heard on the news this evening that we haven't been above 30º in over 3 weeks! I'd barely seen or photographed any birds until I got to the north side. Even the duck pond was nearly empty save for about 10 Mallards huddled up under the eroding bank. My best birds of the day were probably a pair of Red-bellied Woodpeckers calling loudly back and forth. This one is the female with her red crown stopping halfway up her head as opposed to the male who's red crown goes all the way up to his beak. 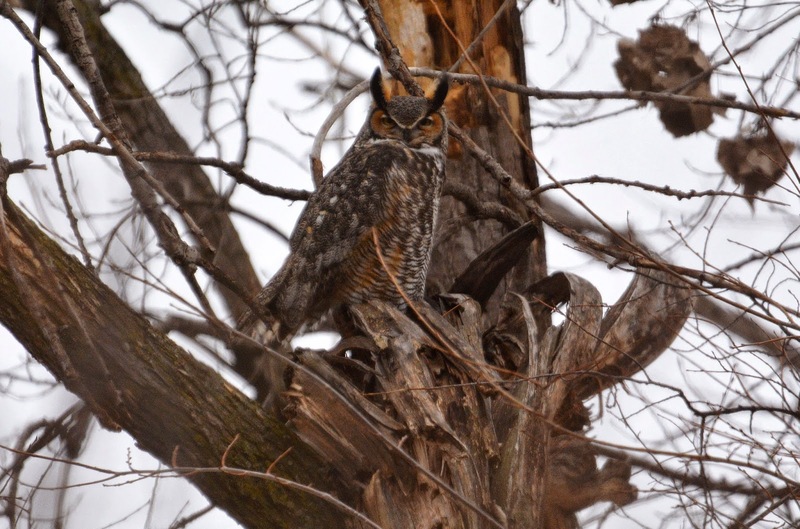 I'd hiked into the woods a little ways to find the Woodpeckers and to my surprise I scared up a Great Horned Owl. This would have been the male who is tending to his nesting mate. I thought I was far enough away from the nest to bump into him but apparently not. I didn't see where he landed again until I'd walked a ways past the nest in the other direction. Then I noticed him again right from the paved trail. His eyes were glowing yellow even though the sun was more or less behind him. Near the end of my walk I finally started seeing a few other birds including Northern Cardinals, Dark-eyed Juncos, American Robins, Black-capped Chickadees and Downy Woodpeckers. The Downy's seemed completely oblivious to my presence today and had I wanted to, I could have reached out and touched more than one of them. They were so close to me that I had to back up in order to get them in my viewfinder. I watched them for quite a while as the hammered away at various twigs and vines looking for a tasty morsel. Being so close I really got a new appreciation for just how small of birds they are. This was my favorite photo of them all mostly because of the blue sky behind the bird. This Saturday was another cold day, even though we're nearing the end of February. My job unexpectedly kept me home for the morning and I wasn't able to get to the park until just after 1:00pm. When I finally arrived at the park I hadn't walked more than 50 feet when some friends of mine pulled in and honked at me. Having been in such a bad mood previously, I was happy to see them and asked if they'd walk all the way around the park with me. They obliged and we kept a pretty brisk pace in order to stay warm. It was completely sunny though which was nice. I didn't take many photos as were busy talking and catching up. So when we came back to our vehicles, I decided to stay out longer in search of some birds. First I hiked a little ways into the woods and watched some Dark-eyed Juncos, House Finches and a pair of Northern Cardinals. This female seemed like she was being pursued by the male and she kept changing perches. Finally she stayed put long enough for a few pics. 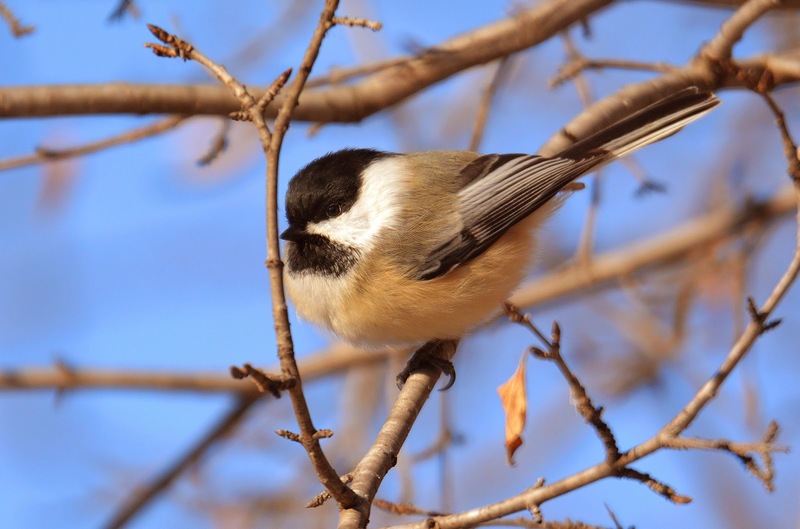 Staying along this course I eventually caught up with a couple of Black-capped Chickadees picking at the tree buds. They are fast little buggers and very hard to catch a decent photo of. It reminded me that Warblers will soon be back in just another couple of months so I'd better start practicing! 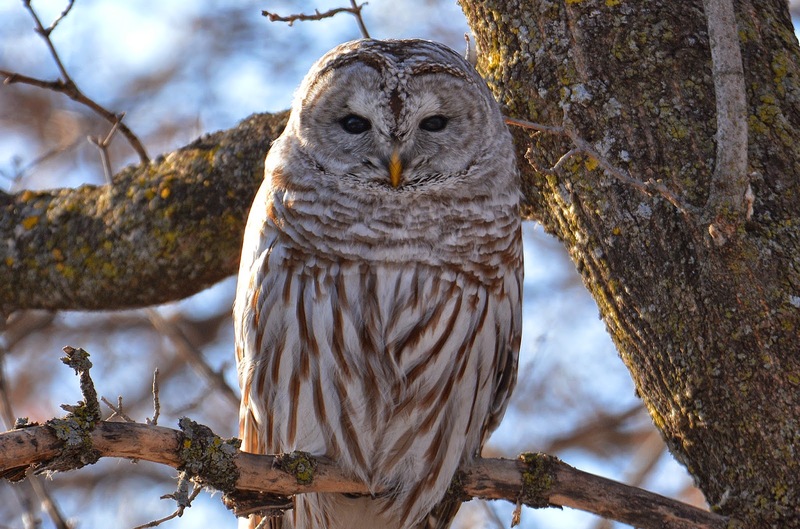 A little ways further and now running into thicker Buckthorn trees, I spotted a Barred Owl perched right out in the open. I had to look pretty much right into the sun to see it and the bright light almost made the Owl appear to glow on the sides. I stayed a fair distance back as to not bump it, took a few shots, thanked the Owl and then went on my way quietly. 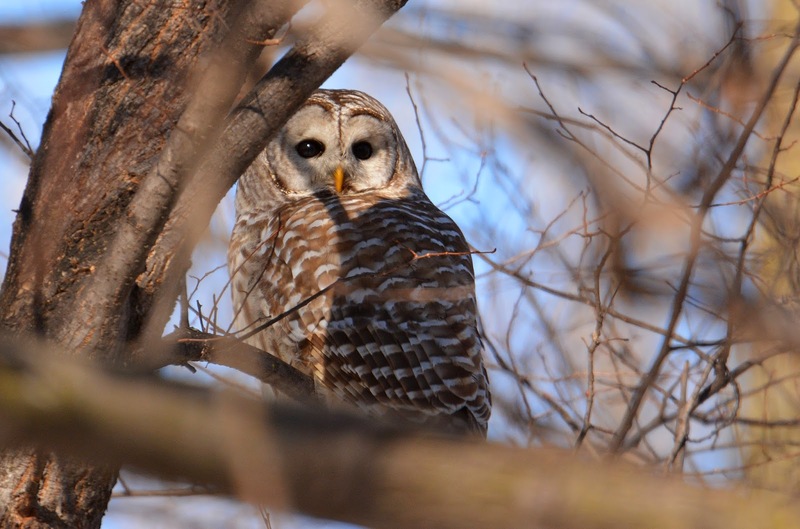 Barred Owls will be pairing up very soon and scoping out a nesting area IF there is indeed another one in the park. Well just 5 minutes later I think I can prove that theory correct. As I exited the woods and got back out onto the paved path, I picked up my pace to warm up again. 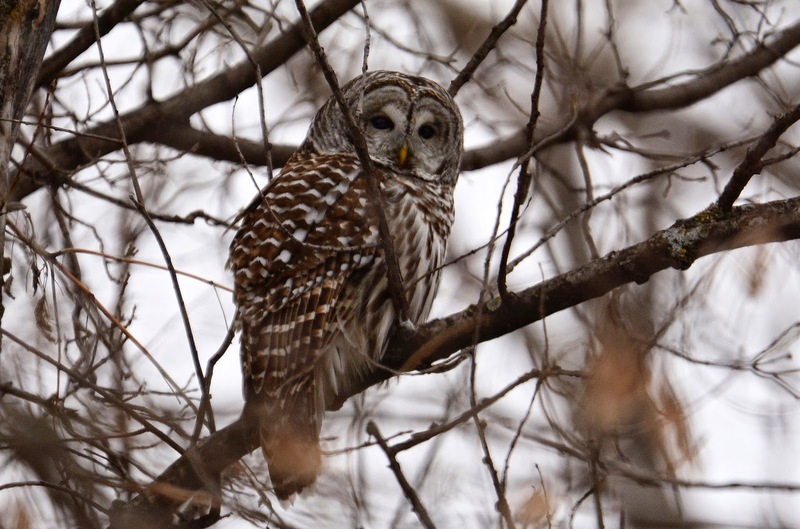 But I didn't get very far before I spotted another Barred Owl! This one could be seen right from the paved path and so little time had gone by, I really doubted it was the same one. Yes, it certainly could have flown over to this other area in the time, but I just have a hunch that it's a different bird. Having seen 3 Great-Horned Owls earlier with my 2 friends, this made a total of 5 Owls I saw in one visit which might be a new record for me! By this time I was 1/3 of the way around the park again, and I really wanted to visit the "duck pond" one more time. The light was getting even nicer now and I thought it might make a good time to watch and photograph the Mallards. Indeed there was lots of duck activity and good chances to catch the drakes shining in the sun. I would keep my eye clear of my viewfinder just long enough to notice one that was diving and bathing. Then I would attempt to zero in on that duck as it raised up and flapped it's wings to dry and such. I didn't take this photo in a vertical format, but cropped it so later as I just thought it made a more interesting photo. And I like how you can see the water droplets on his head too. Come to think of it, these Mallards have given me lots of practice time with my new camera lately. Coming back to my vehicle yet again, I was thinking that I've not hiked around the entire perimeter for a loooong time! Also I'd hiked nearly another 30 minutes past 5:00pm for the first time in quite a while. On day 2 of my Great Backyard Bird Count, I certainly felt like I saw more species. At the time of my hike it was near 8 or 10º above which definitely felt warmer than yesterday. And thank goodness the wind had subsided. 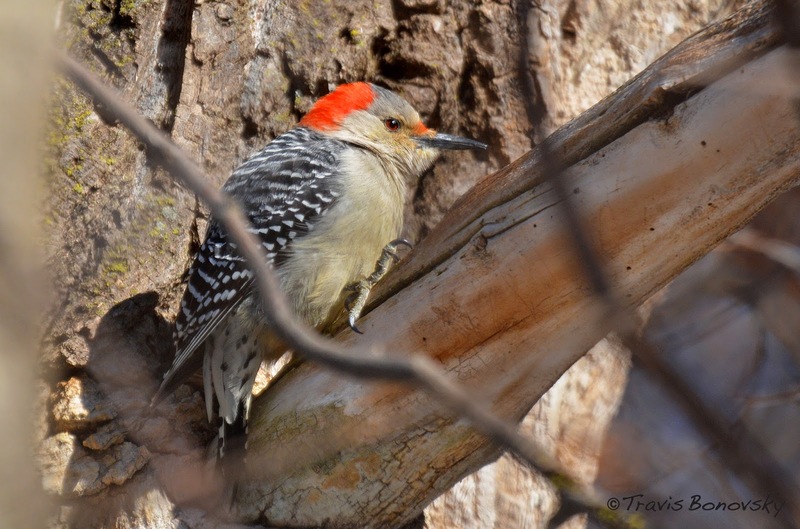 The park felt more active for wildlife today and I was seeing Downy and Hairy Woodpeckers left and right. 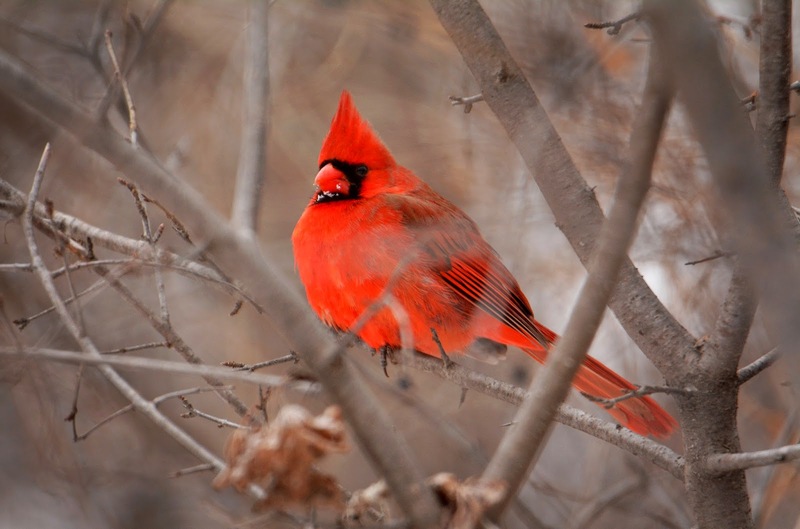 There were also a fair amount of Cardinals active today and both male and female were visible. As I exited the wooded area from the north side heading west, a Red-tailed Hawk flew right past me. This is in the area where I've seen 2 of them this winter but after looking around for a bit I could not find another. On the south side at the duck pond the open water has shrunken yet more in size forcing more Mallards to find water elsewhere. There's still good numbers of them here thought that I'd estimate at 70 to 75. On the wood chip trail here I took particular interest in both a White-breasted Nuthatch and another Downy Woodpecker. 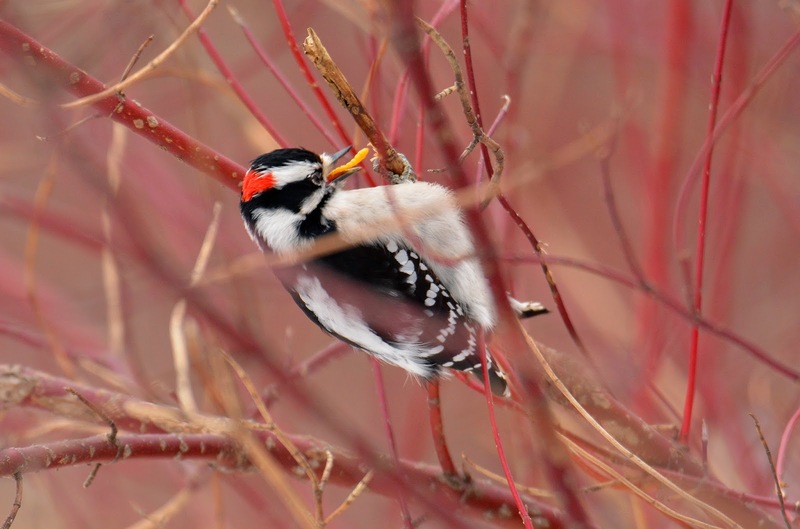 The Downy was in a bush of Red-osier Dogwood and busily pecking at it's thin twigs. I crept up on it and took a few successive photos in burst mode. When I got home I was surprised to find that I'd captured the very moment when it pulled some kind of insect larva from the shrub! Essentially this happened within 3 frames I'd taken at 6 frames per second –meaning it found and pulled the larva in about one half a second. I find it incredibly interesting how skilled Woodpeckers are at finding and extracting something like this during the height of winter. Quite amazing. Further along I found a male Great Horned Owl standing guard near his now nesting mate. This big, snapped off tree wasn't exactly the place I would expect to see an Owl perch. He looked kind of like a king on a throne up there. The light here was terrible and I shot through a lot of brush for the photo and it turned out pretty grainy. My last good sighting of the day was quite a good one for many reasons. I was hiking on the wood chip trail heading towards where Shingle Creek empties back out of the lake. I was about to turn the corner at the creek when I thought I saw some wadded up old newspaper caught in a tree down near the frozen creek. Upon closer inspection it was a small raptor! Because of the birds vibrant orangey tone, I firs thought it was an American Kestrel –which is our smallest species of Falcon. But the face didn't seem right. At the point of noticing the bird I was already only 30 feet away. As I stood there taking photos the bird hadn't really paid me any attention so I approached a bit closer, hiking down the creek bank and half way out onto the frozen water. At this distance I was more skeptical and my only other thought is that it was a Merlin. A Merlin is also a Falcon but slightly larger and slimmer than a Kestrel. I have only seen a Merlin once before in the Palmer Lake Park area, but I did have a good opportunity to view another wild one last fall at Hillside Cemetery in North Minneapolis. That one had a much more distinct "mustache" our dark, vertical markings extending down from the front of the eye. This bird did not really show that and also showed a fairly bright "blueish" colored cap on it's head. I posted the photo to the Minnesota Birding Facebook page and learned that it is a known subspecies of Merlin called the "Prairie Merlin or Richardson's Merlin!" I don't think I would count this as a new species for the park but it is certainly interesting to note! 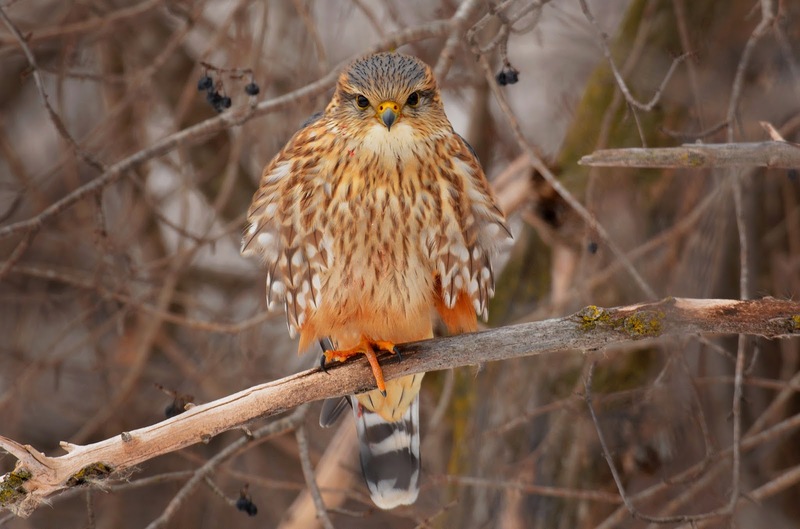 According to the Cornell Lab of Ornithology, the Prairie Merlin subspecies occurs in Great Plains states and southern Canada. A few years ago I started a tradition of making sure to participate in the annual Great Backyard Bird Count or "GBBC" every February. At the time I guess I didn't quite realize that it's kind of a marketing scheme to get bird watchers to start using an online reporting tool called ebird. Not implying anything negative by that, it's just that when I did my first count I hadn't realized the tool already existed before I heard about the GBBC. In fact ebird is setup to allow you to report on a daily basis and for multiple locations including your own back yard. Anyhow, I think this is the 3rd or 4th year that I've made sure to pay more attention to what I'm seeing at the park and report it online when I get home. Last year my goal was to find a Northern Shrike to report. This year my goal was to report at least one Owl. I was joined by another good birder friend of mine today and we made our way around the entire perimeter before doing some off the trail hiking as well. The temperature at the time was roughly 0º and it was quite windy on top of it. It was hard to dress warm enough and my face was numb within minutes. Our first stop was at the duck pond where we could see that the area of open water had shrunk nearly in half from it's previous size. 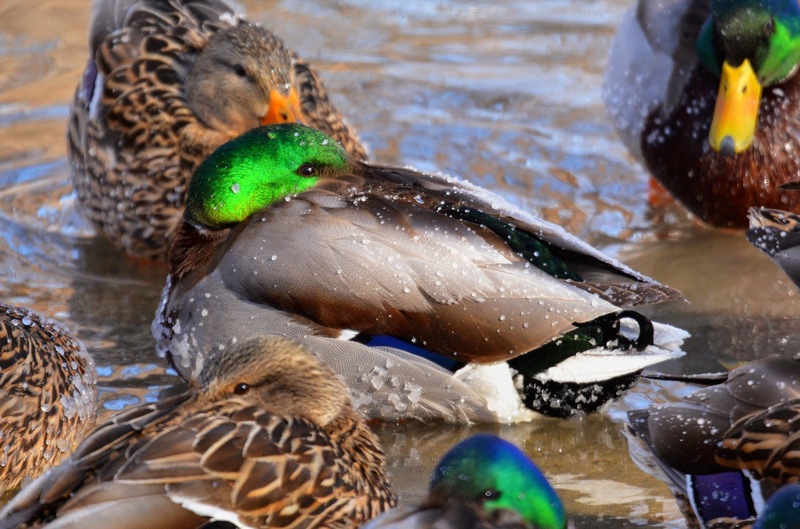 I estimate there were about 80 Mallards here today and there was barely enough room for them in the water. No sign of a Black Duck or anything else unusual but it was interesting to watch how they managed the cold weather. Most had their head tucked back and were covered in ice crystals. Despite the temps it was completely sunny out today so when we got out of the wind it was more tolerable. 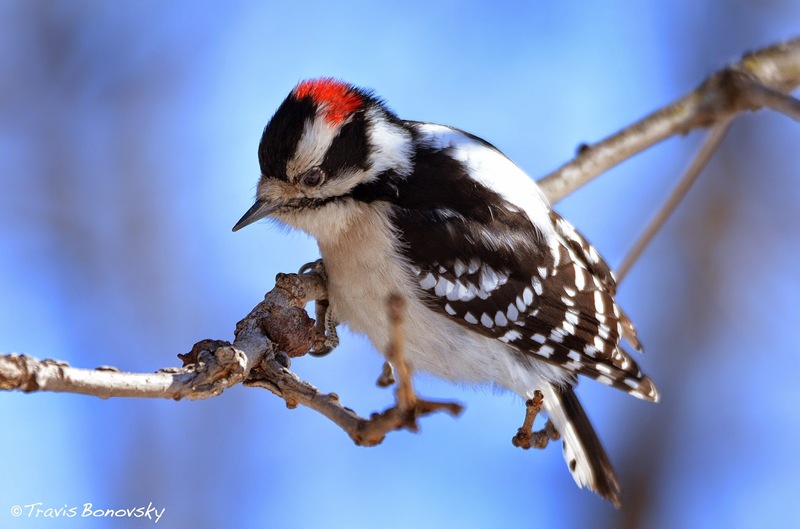 Birds were expectedly not very active today save for a few Robins, Cardinals, Chickadees and Hairy Woodpeckers. 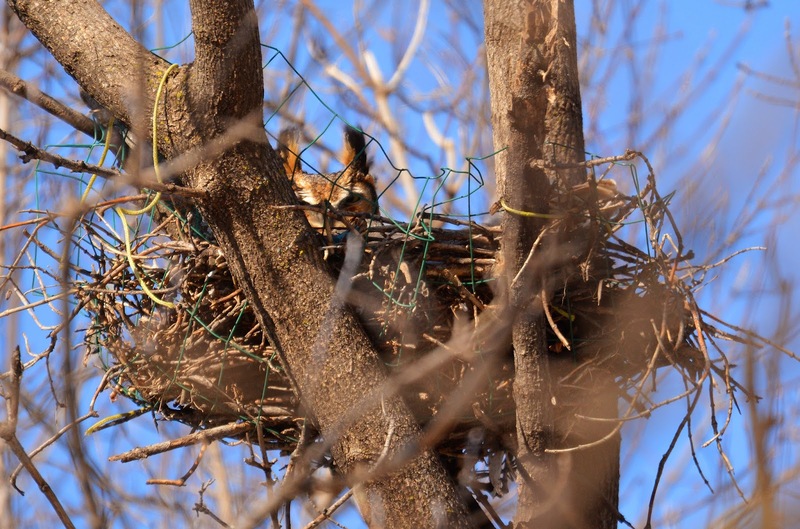 Having spotted one Great Horned Owl already, we spotted two more later on –a pair using a reconstructed Cooper's Hawk nest that I played a part in back in July of 2012. I wont say exactly where this is in the park to avoid extra attention as I know that dedicated bird watchers will find this on their own sooner or later. Much later on we ran into another birder friend of ours who stated that he just saw a Barred Owl fly through the woods. At first we were unsuccessful in relocating it and were about to give up. 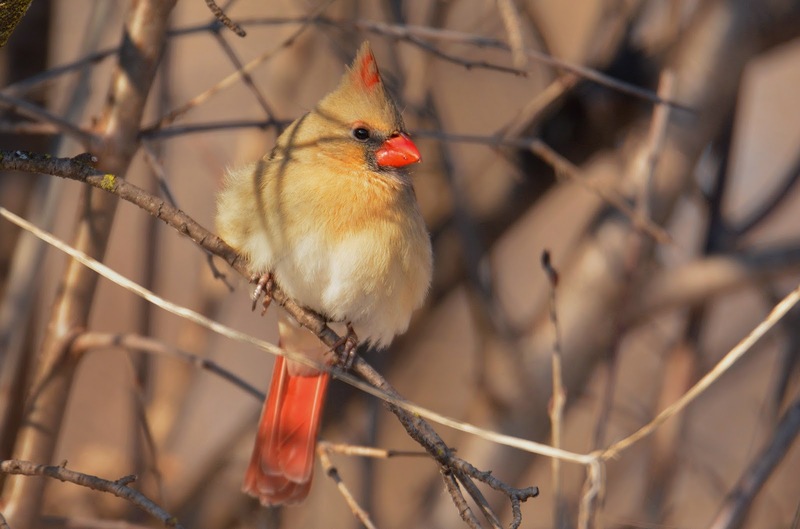 But when we hiked into the woods a little ways to see if we could get closer to some Cardinals and House Finches, there it was! 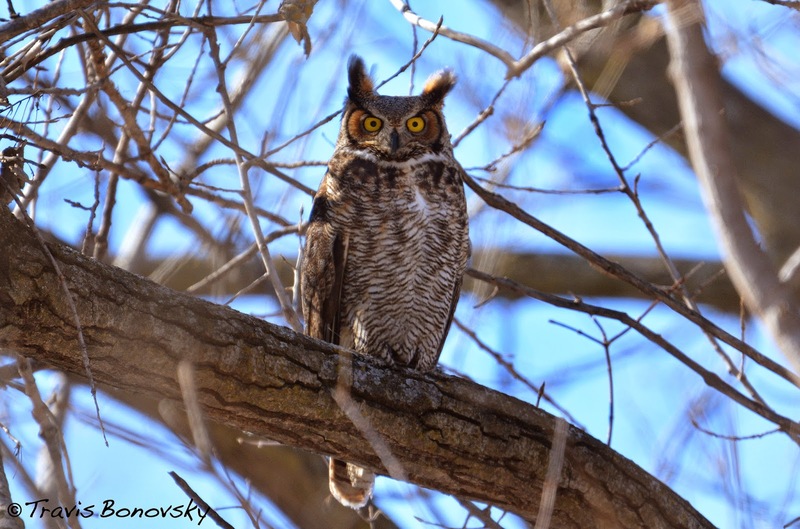 I was quite happy to report a total of 4 Owls and 2 different Owl species to the GBBC. I plan on doing the same again tomorrow. A New Species at the Park! When I arrived at the park this Sunday I had only walked a few feet before running into another park goer and we struck up a conversation. And while we were talking then another friend of mine showed up. This friend is a much more experienced birder than myself and I figured maybe we'd see more if we hiked together. Though we were lucky enough to spot a Barred Owl right off the bat, the park was pretty quiet for the remainder of our hike. 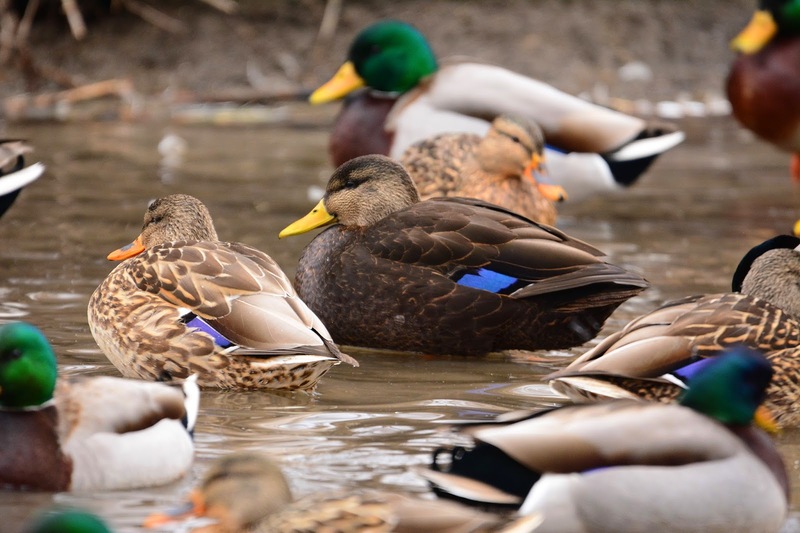 On days like this when there's just not much to see, I like to spend more time looking at the Mallards in the duck pond on the southeast corner of the park. As we arrived I told my friend "I keep thinking I might see a Black Duck here one of these days." Well what do you think happened next? My friend says "say, what's that one over there?" As we both looked through our binoculars, it wasn't quite obvious at first. One lone duck looking quite similar to a female Mallard but darker. Was it the elusive American Black Duck that I was hoping to see? As we watched other Mallards part left and right the duck in question finally came into full view and YES indeed it was an American Black Duck! Now I think I might have seen this species earlier in the year down at Black Dog Road in Bloomington, but they were so far away I couldn't positively ID them. But here was one right in front of me and with Mallards to compare with! I could hardly believe what an opportunity this was. 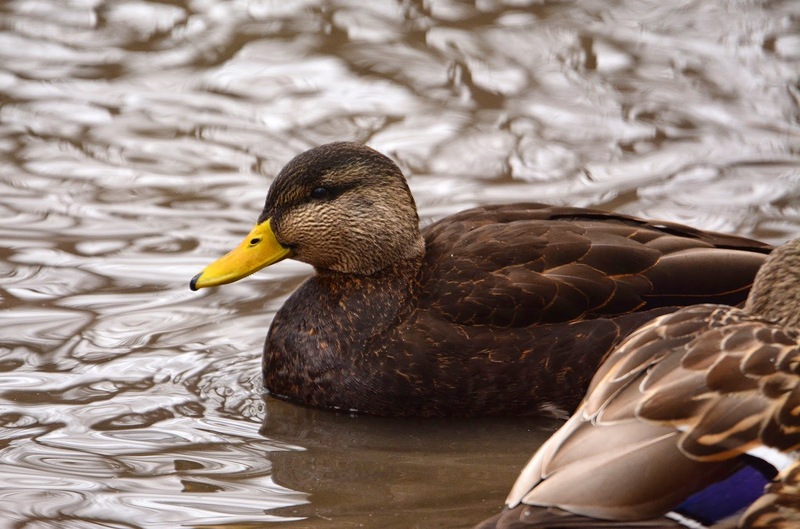 At the time I only knew 2 characteristics to look for in a Black Duck; a darker overall color, and an olive-green colored bill (as opposed to a bright orange bill of a female Mallard). These where visible but at this proximity I learned yet 2 more characteristics. Maybe the most obvious one –at this distance anyway– is the lack of white "edging" or borders on the outside of the blue wing patch that can be seen on Mallards. On the Black Duck the blue patch is bordered by black only and then stops. 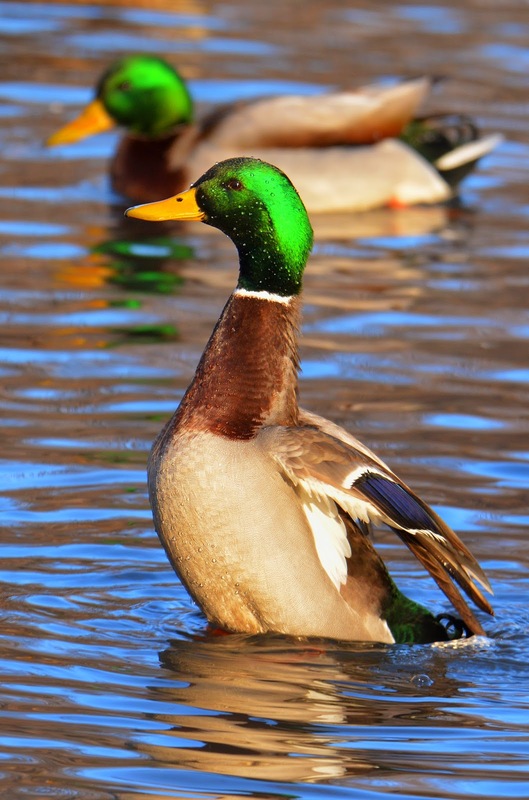 Also both Mallards tend to have white tail feathers jutting out their rear where the Black Duck has the same color tone all the way back. 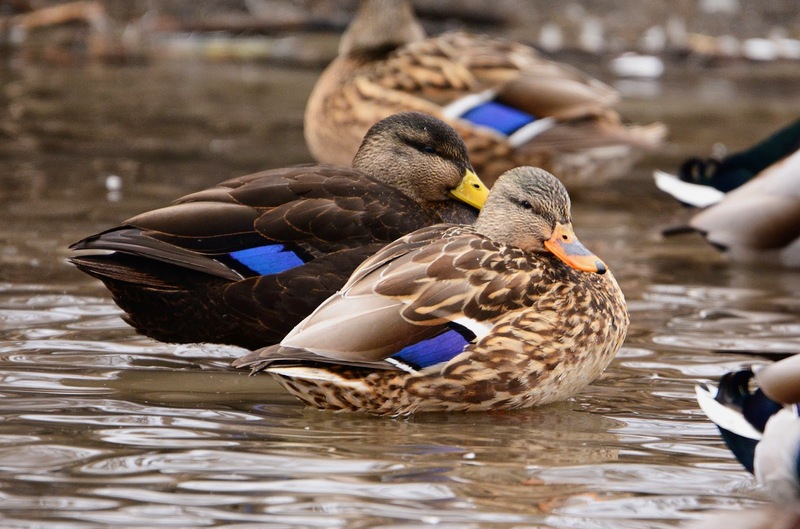 I was so excited to finally see this species of Waterfowl close up and even more excited to find it at Palmer Lake Park! 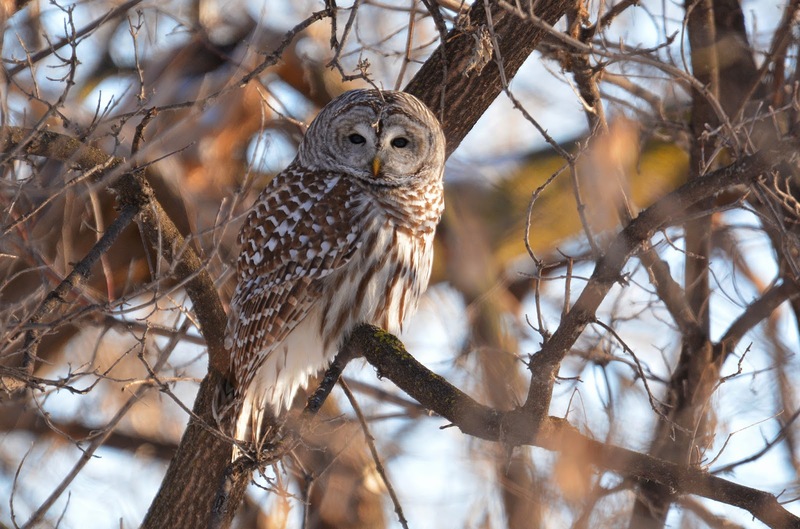 My friend, the experienced birder had seen them before but had stated that he'd only seen them very far north up near Orr, Minnesota. So it was even a thrill for him too! This species has been reported recently on the river at Fort Snelling State Park so they are indeed further south. We spent maybe 15 minutes watching it before finally moving on. Near the south side of the park we spotted a group of 4 deer leap across 69th Avenue and into the PLP area. They ran right in front of us but I was unprepared and didn't get a very good photo. After getting back to our vehicles I finally looked at the time and realized that we had been hiking around the park for 6 hours! Well after a full 5 years of blogging about nature, I suppose it is time to admit it. I am a photo-hound. A shutter-bug, a photography junkie or whatever you'd like to call it. I just plain love taking photos of nature. But for me the subject HAS to be nature, otherwise I lose interest pretty quick. The two passions are very intertwined for me and I suppose you could say the only thing I love more than nature is photographing it. The thing that I always loved about photographing nature is that you can "shoot first and ask questions later!" In doing so, I was able to learn to identify things by studying them later, comparing to other images and asking others for assistance. Which is not something you can really do in the field. And when it comes to birds, well, birds don't just sit still and wait for you to get a good look at them! So photography for me was the best tool I could think of to help me understand what I was looking at. Though I can now identify most Minnesota birds without much difficulty, I still study my own photos when it comes to particular birds that are harder to identify. I am slowly learning my plant species in the exact same fashion, photographing them first and looking them up later. 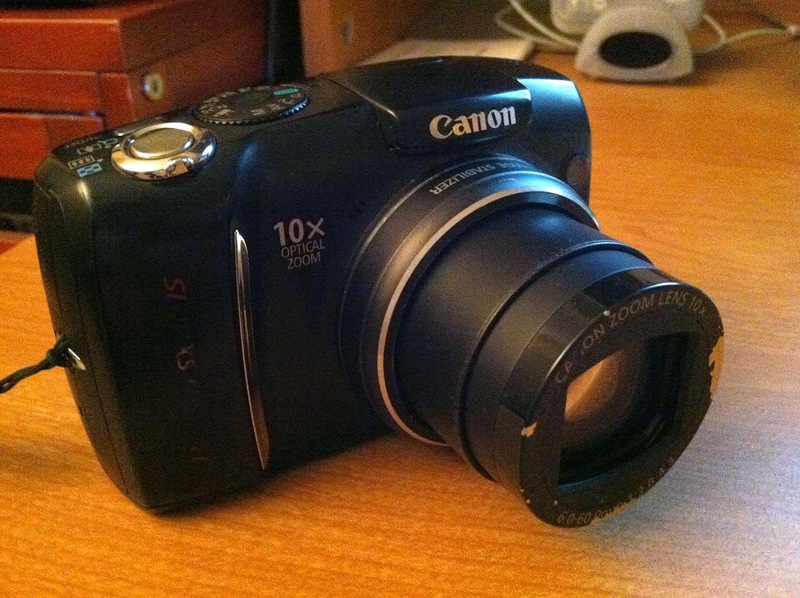 Back in 2009 when I officially launched this blog, I was using a Canon SX110is "point-and-shoot" camera which I bought for somewhere around $200 at the time. It was 9.0 Megapixels and had a fixed lens with 10x optical zoom and 40x digital (fake) zoom. I found that if I held perfectly still and didn't breath that I could sometimes get a photograph of a bird or deer a long ways away. I remember maxing out the 40x digital zoom quite often. Looking back now, it almost makes me laugh having used it for as long as I did. But it worked! After looking at other's amazingly detailed nature photos, I decided to make the leap to a DSLR camera in March of 2012. I ordered a Nikon D5100 with an optional 55-300mm lens as a package for around $1,000. I was in heaven! Finally I was capturing images that not only helped me identify things, but also looked beautiful and did justice to my subject. Truly not knowing anything about photography, I shot the majority of my photos in "auto" mode, which is another thing that now makes me laugh later. I used this setup exclusively for the next few years until making yet another leap, this time to a longer zoom lens. Though a 300mm can work dandy when you're able to approach birds closely, it just wasn't cutting it for other situations. I started looking around and different options, namely a Sigma 150-500mm which was a standard, affordable lens for wildlife photography. But upon hearing of a brand new lens being introduced by Tamron, I decided to hold out just a while longer and purchase a whopper of a zoom –the Tamron model A011 150-600mm lens! The lens alone cost roughly the same as my existing camera body and 300mm lens combined. But that being said, it was still a more affordable option than others out there. At the time I placed my order in January of 2014, this new Tamron lens was on backorder and hadn't been produced in quantity yet for a Nikon camera. I figured "no problem, it will be here before spring and Warbler season." Ha! Little did I know that this lens wouldn't be in my hands until July of 2014. And when I finally did receive it, I was a bit overwhelmed by it. For starters it dwarfed by previous lens and was very heavy! And no longer did "auto" mode on my camera capture the same sharpness of images I was expecting. I was then and therein after thrown abruptly into the world of "aperture, shutter speed, ISO and other photography technology. I struggled enough at first with my new lens to force myself to figure out at least some manual settings that would give me better images. In a way I'm quite thankful for that experience and it has been enjoyable to experiment to the point where I'm more confident in my abilities. Looking back and comparing my photos now really tells a better story of how far I've come. Here are two images side-by-side of a Green Heron, both taken at Palmer Lake Park. The one on the left is from 2009 with my old Canon point-and-shoot, and the one on the right is from 2014 with my Nikon D5100 and Tamron 600mm lens. While not the same bird in the same pose, the difference in quality is pretty obvious. As of just a few weeks ago in early Feb of 2015, I've made my latest (and likely not my last) leap into a newer camera body –this time a Nikon D7100. I'm still going through a learning curve with it but so far I think I've replicated most of the settings I like from my previous camera. So far it seems this model will be one I can grow even further with and I look forward to capturing some great shots this spring! And in case you're wondering, I have yet to use a tripod or monopod for any of my nature photographs. I "hand-hold" my camera and lens for every shot as I enjoy covering a fair amount of ground when I go out for a nature hike. I've learned to tuck the heavy lens under one of my arms and carry it until I need it. So as of now my current setup is a Nikon D7100 with the Tamron 150-600mm lens. Who knows what I'll be using 5 or 10 years from now. I never expected to go quite this deep into photography in the first place!